Jonathan Skrimshire - Council for the Municipal District of Pincher Creek passed the 2018 property tax bylaw at their meeting of April 10. Municipal tax rates are up across the board, with mill rate increases of 4.5 percent on residential property and farmland, and 8.3 percent on non-residential property, machinery, and equipment used in the generation of power. Total municipal property taxes are up $388,173 to $10,947,850, representing a 3.7 percent increase over 2017. 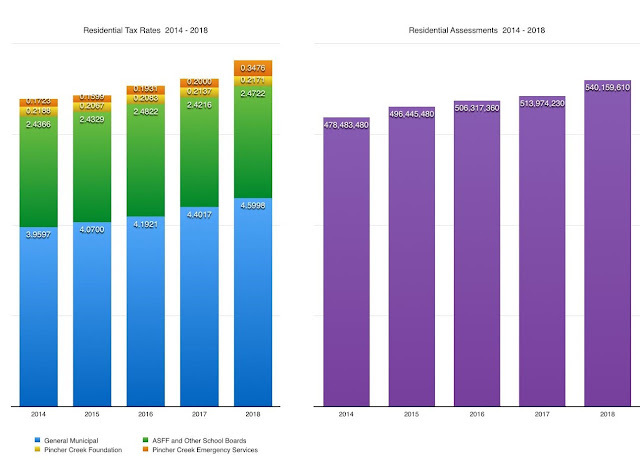 Tax rates for schools, seniors lodging and emergency services are also up substantially, with an increase of 7.1% in the combined residential mill rates for those services. The impact of all 2018 tax rate changes on actual tax payable will be heavily affected by substantial changes in assessment values, with residential properties being the hardest hit category. The table below presents the municipal tax rates and tax levies for 2018, together with comparative figures from 2017 and the associated dollar and percentage increases or decreases. The taxes outlined in this section are retained by the MD to fund the operations of the municipality for the 2018 fiscal year. The 2018 residential mill rate is 4.5998. A total of $2,484,626 will be levied against property in this class. This is a 9.8% increase over the 2017 levy of $2,262,360 and represents an additional $222,265 to be extracted from owners of residential properties throughout the MD. This increase will be reflected in the dollar figure found in the "Municipal-Residential" line item of the "Municipal Tax Details" section of the forthcoming 2018 assessment and tax notices. The 9.8 percent increase in the residential tax levy is attributable in roughly equal parts to an increase in the tax rate and an increase in the total assessed value of residential properties within the Municipal District. It is important to understand that this is an aggregate figure representing the total increase across the whole MD. The increase in the tax levied against any specific residential property may deviate substantially from the 9.8 percent figure, depending on the magnitude of the change in the 2018 assessed value of the property in question. The 2018 farmland mill rate is 6.6480. A total of $390,827 will be levied against property in this class. This is a $16,821 increase over the 2017 levy, representing an increase of 4.5 percent. This increase is wholly attributable to the increased tax rate for 2018. The assessed value of farmland within the MD is essentially unchanged from the previous year. The 2018 non-residential mill rate is 8.8357. A total of $2,777,835 will be levied against property in this class. This is a $130,566 increase over the 2017 levy, representing an increase of 4.9 percent. This increase is the combined effect of a substantially increased tax rate and an offsetting decrease in the assessed value of non-residential property. The 2018 machinery and equipment mill rate is 8.8357. A total of $1,580,424 will be levied against property in this class. This is a $191,620 decrease from the 2017 levy, representing a decrease of 10.8 percent. This decrease is the combined effect of a substantially increased tax rate and a dramatic decrease in the assessed value of machinery and equipment. The 2018 electrical cogeneration mill rate is 8.8357. A total of $3,714,136 will be levied against property in this class. This is a $210,150 increase over the 2017 levy, representing an increase of 6 percent. This increase is the combined effect of a substantially increased tax rate and a modest decrease in the assessed value of electrical cogeneration property. A grand total of $10,947,850 will be levied against all classes of property for 2018. This is a $388,173 increase over the grand total levied in 2017, representing a year over year increase in total municipal property taxes of 3.7 percent. 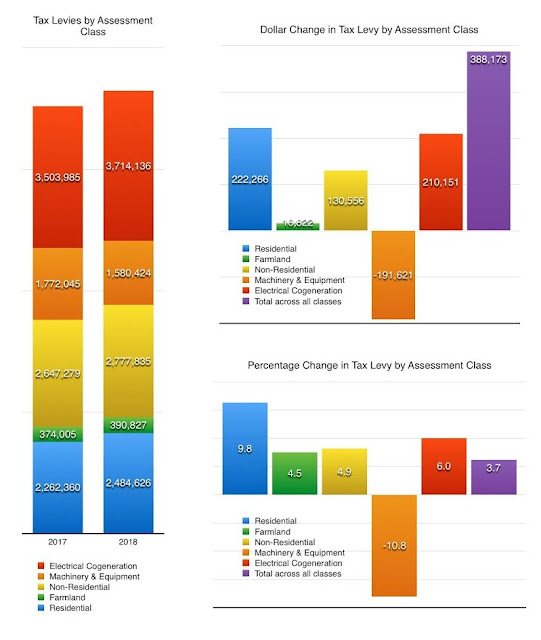 The graphics below illustrate the composition of the total municipal tax levies for 2017 and 2018, and the changes in the amounts levied against each property class, expressed both in dollars and as a percentage increase or decrease. The table below outlines the 2018 tax rates and tax levies for schools, seniors lodging, fire and ambulance protection, and a new designated industrial properties tax. These taxes are collected by the MD on behalf of other agencies. The 2018 Alberta School Foundation Fund mill rate for residential property and farmland is 2.4722. A total of $1,480,720 will be levied against these classes of property to meet the combined funding requirements of public schools and Roman Catholic schools within the MD. This is a $94,623 increase over the 2017 levy, representing an increase of 6.8 percent. This increase is the combined effect of a small increase in the tax rate and a substantial increase in the assessed value of residential properties. The 2018 Alberta School Foundation Fund mill rate for nonresidential property is 3.8345. A total of $1,201,320 will be levied against this class of property to meet school funding requirements. This is a $72,078 decrease from the 2017 levy, representing a 5.7 percent decrease. This decrease is attributable in roughly equal measures to a decrease in the tax rate and a decrease in the assessed value of non-residential properties. The 2018 Pincher Creek Foundation mill rate is 0.2171. A total of $328,139 will be levied against all classes of property to meet the funding requirements of the Foundation. This is a $1,603 decrease from the 2017 levy, representing a 0.5 percent decrease. This decrease is attributable to a decrease in the Foundation's funding requisition for 2018. The 2018 Pincher Creek Emergency Services Commission mill rate is 0.3476. A total of $525,765 will be levied against all classes of property to meet the funding requirements of the Commission. This is a $216,961 increase over the 2017 levy, representing a 70.3 percent increase for 2018. That is not a typo. And the exact nature of this increase is sufficiently confusing that it requires a somewhat more involved explanation. The funding request from the Commission has indeed taken a huge leap. But the bulk of that leap actually took place a year ago. The 70.3 percent increase in the levy for 2018 is the combined effect of a large increase in the Commission's 2018 requisition, piled on top of the delayed effect of an even bigger increase that took place in 2017. The 2017 Emergency Services Commission tax levy of $308,804 did not actually meet the 2017 funding requirements of the Commission. In the 2017 fiscal year, the MD covered the balance of the $438,029 Emergency Services Commission requisition with municipal funds drawn from the Mill Rate Stabilization Reserve. This had the effect of masking both the true cost of the service and the magnitude of the 2017 increase. Council did not repeat that practice this year. As a result, the full cost for 2018 will be reflected in the Emergency Services line item that appears in municipal tax notices. The increase in that line item on residential bills will be over 70 percent. The 2018 designated industrial properties mill rate is 0.0341. A total of $30,241 will be levied against this class of property. This is a new requisition that has been imposed by the provincial government to recover the costs of performing the annual assessment on certain forms of industrial property. A grand total of $3,186,566 in non-municipal property taxes will be levied for 2018. This is a $268,144 increase over the 2017 levy, representing an 8.1 percent increase in total non-municipal property taxes. These monies are not retained by the MD. The full amount is disbursed to the external agencies identified above. The table below presents the tax rates and mill rates for each of the taxes applicable to residential property, together with the effective total residential rates for both 2017 and 2018. The general municipal mill rate has increased 4.5 percent. The sum of the mill rates for the schools, the Pincher Creek Foundation, and Pincher Creek Emergency Services has increased 7.1 percent. The effective total mill rate, which is the sum of the four mill rates above, is 7.6367, which represents an increase of 5.5 percent in the total mill rate applicable to residential property for 2018. The effect of that increase on actual tax payable is amplified by the 5.1 percent increase in assessed residential property values across the MD. The effect is multiplicative, not additive, resulting in an overall increase of 10.9 percent in the total tax load on residential properties for 2018. Again, it is important to understand that this is an aggregate figure, representing the total change across the MD. The actual change in tax payable on any specific property may deviate substantially from that figure, depending on the magnitude of the increase in the assessed value of the property in question. The graphs below illustrate the growth in the total effective residential mill rate and the growth in total residential valuation over the five year period 2014 to 2018. As is evident from the graphs, the increases in both are somewhat larger in 2018 than in recent years. Questions, concerns and comments regarding municipal tax rates or the way the municipal tax burden is apportioned across different classes of property are appropriately directed to elected members of Council or MD staff. Concerns or comments regarding the tax burden imposed by non-municipal taxes should be directed to the Ministry of Education, the Ministry of Seniors and Housing, or the Board of the Pincher Creek Emergency Services Commission. The Municipal District of Pincher Creek is obliged by law to satisfy the funding requisitions presented by those external agencies. Council has no control over the budgets of those agencies and is not accountable for the size of the funding requisitions they impose upon the municipality. To determine the exact impact of the 2018 rate changes on your own residence, get out a calculator, find your 2017 tax notice, and download the 2018 assessment roll, to be found at the link below. Determine the 2018 assessment of your residential property. If it is unchanged from 2017, you will be facing a 4.5% increase in the "Municipal-Residential" line item of your 2018 notice, and a 7.1% increase in the combined basket of other taxes applicable to the value of your home. If the assessed value of your residential property has increased substantially, use the tax rates to calculate tax payable. The general municipal tax payable on the value of your residence equals 0.0045998 times the assessed value. The precise amounts of the other applicable taxes can be calculated in the same way by using the appropriate tax rates drawn from the tables in the article. I am in the process of gathering information regarding some of the spending undertaken by our MD government. Currently awaiting response to a Freedom of Information Request regarding the costs incured by the MD to supply water to the water treatment plant and the severance paid to our departed CAO. What's already spent is money under the bridge but it is important that Council learns from past mistakes and makes changes so our taxes do not continue to escalate. For example, the whole MD currently subsidizes the water supply to Lundbreck and Cowley, are we going to do the same for Beaver Mines and the Castle Park? Are we going to pay attention to the operating costs prior to deciding on a solution for the Beaver Mines wastewater? Are we going to pay attention to the employment agreement with the next CAO so the taxpayer is not on the hook when things don't work out? Our current Council has taken much discussion behind closed doors and the ratepayers are left in the dark. It's nice of them to come out of camera and tell us how much our taxes are going up but a clearer picture of where the money is being spent and what is being done to control the spending is in order.